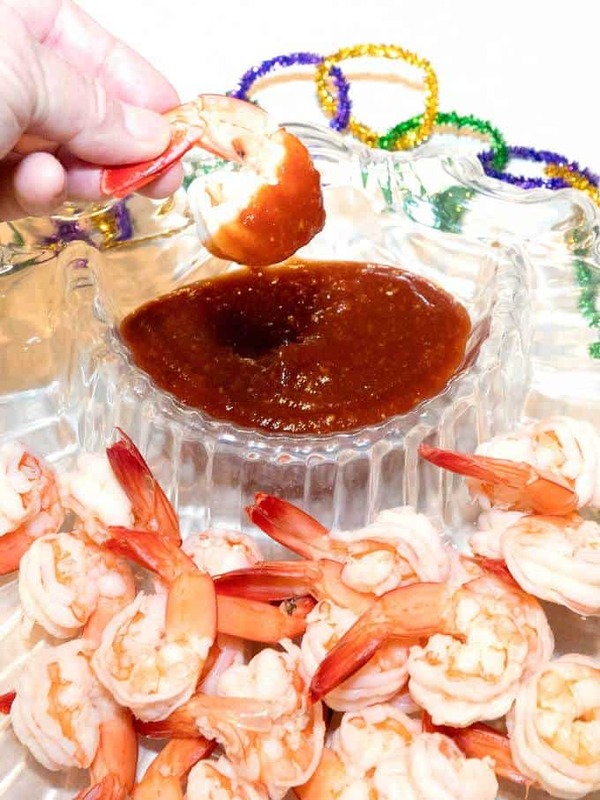 Ready in minutes and always a crowd pleaser, Classic Shrimp Cocktail is the perfect make-ahead appetizer for your next Mardi Gras or anytime gathering. 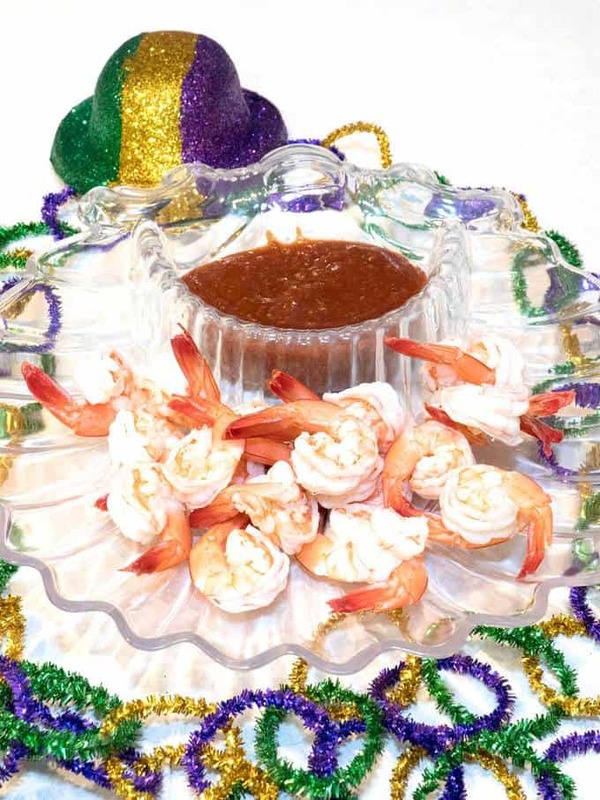 It combines succulent boiled shrimp with a spicy tomato-based sauce for the ultimate blending of flavors. I’ve been making this shrimp cocktail for as long as I can remember. Sometimes for dinner parties, I serve it as a sit-down first course. Other times, I put it on the counter along with other appetizers before the meal. Regardless of how I serve it, the shrimp cocktail disappears in minutes! I always use fresh head-on shrimp from the local fish market. The size that I buy really depends on what looks the freshest. Today, the 10 to 15 count shrimp (10 to 15 shrimp per pound) looked the best. They were amazing. In fact, the Master Taste Tester kept commenting on how good the shrimp were! I started by cleaning and deveining the shrimp. Because I was making shrimp cocktail, I left the tails on to make it easier to hold and dip. Then, I added an onion, stalk of celery, and lemon to a pot of water, along with salt, paprika, hot sauce, and Worcestershire sauce. I brought the water to a boil, reduced the heat, and let it simmer for about 15 minutes to meld the flavors. 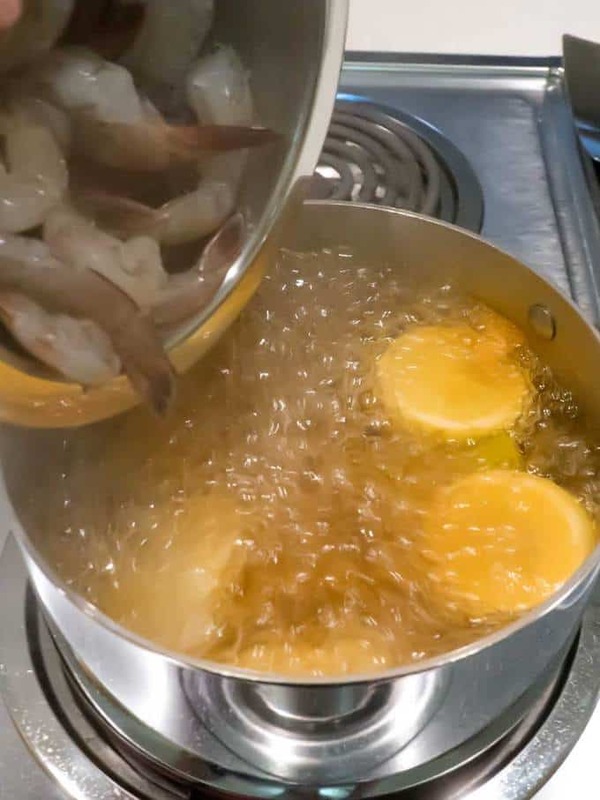 Next, I brought the water to a boil again over high heat, and added the shrimp. Once the water had returned to a boil, I cooked the shrimp for two minutes. 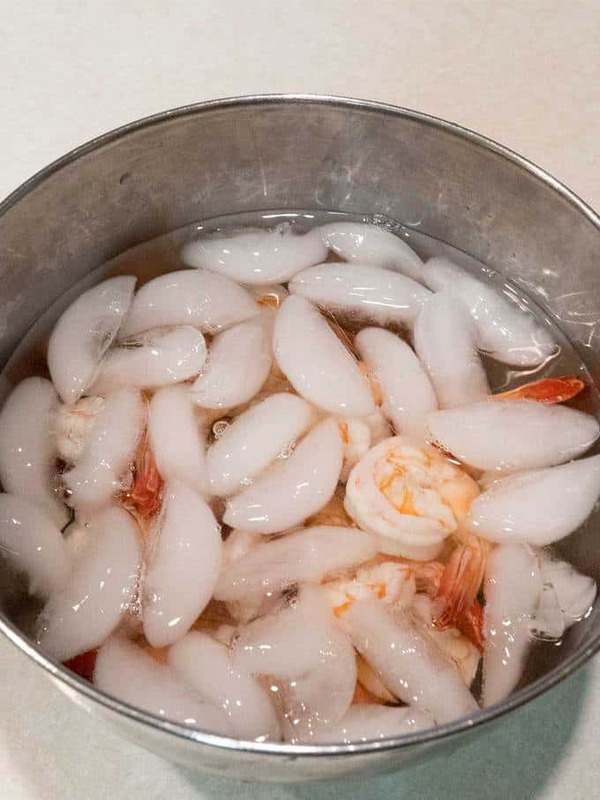 After two minutes, I drained the shrimp in a colander, rinsed them in cold water, and dumped them in a bowl with ice and water. One thing that you never want to do is to overcook shrimp. The Master Taste Tester proclaimed the shrimp perfectly cooked! After the shrimp were thoroughly cooled, I drained them, patted them dry, and put them in the refrigerator. 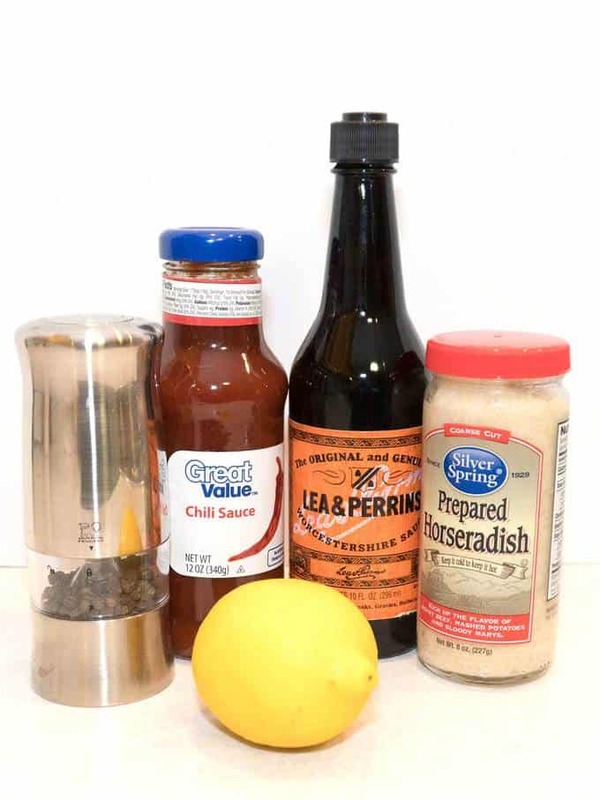 I used the following ingredients for the cocktail sauce: Chili sauce, prepared horseradish, Worcestershire sauce, lemon juice, and freshly ground black pepper. 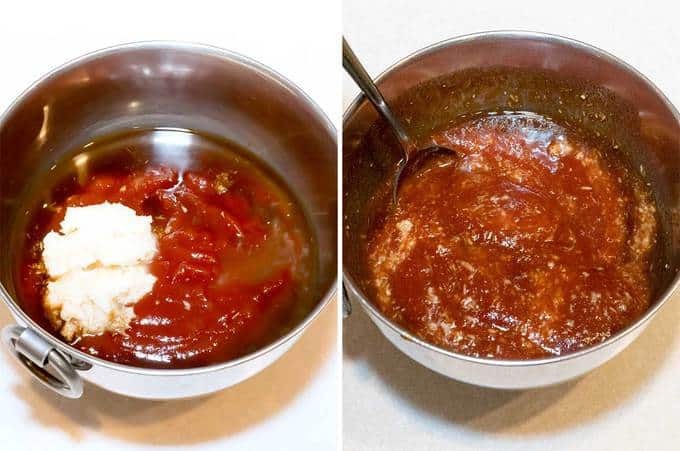 Chili sauce is similar to ketchup, but has a chunky texture and spicier taste. It’s generally next to the ketchup in the grocery store. Prepared horseradish is grated horseradish in vinegar. It’s in the refrigerated section of a grocery store, and is not at all the same as creamy horseradish. I added all of the cocktail sauce ingredients to a small bowl, gave it a stir, and popped it in the refrigerator. How easy is that? Now for the moment of truth! I put the shrimp in a shell-shaped bowl along with the cocktail sauce. Sometimes, I’ll line a large red wine goblet with romaine lettuce, and place 5 or 6 shrimp around the rim of the glass (depending on the size of the shrimp), with the tails to the outside. I’ll add a slice of lemon to the rim of glass. Right before serving, I’ll pour some cocktail sauce on the bed of the lettuce. However I serve it, the Classic Shrimp Cocktail reposted from February 1, 2017, consistently brings praise. Yum! Shrimp: Remove shrimp heads and shells, leaving tails in-tact; devein. 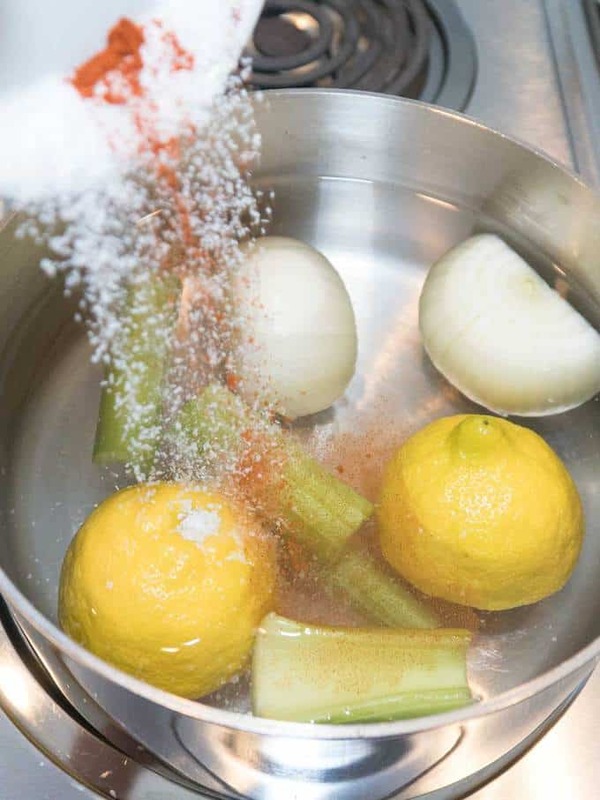 Bring water and seasonings to a boil; reduce heat and simmer for 15 minutes to meld the flavors. Return water to a boil. Add shrimp and return to a boil for 2 minutes. Drain, rinse in cold water, and pour into ice water to cool completely. Rinse well with cold water and drain. Pat shrimp dry with paper towel; refrigerate until ready to use. To assemble, line a large red wine goblet with romaine lettuce. Place 6 to 8 shrimp around the rim of the glass (depending on the size of the shrimp), with the tails to the outside. Place a slice of lemon on rim of glass. May be made 1 hour before serving up to this point. Pour cocktail sauce on bed of lettuce. Serves 4. For variation, place crushed ice in bottom of glass. Line glass with lettuce and proceed as above.